It is also a bird in trouble. Its mating, nesting, and primary food source all require broad swathes of sage grass uplands. The species has experienced range-wide population declines due to loss of habitat from agricultural development, large-scale range improvements (sagebrush control), urban and exurban development, large wildfires, invasive plants, and more recently energy development. For years the greater sage-grouse has been protected by state law throughout its range and managed as an upland game bird by state wildlife agencies. 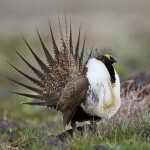 However, in the face of continuing indicators that the species was threatened, the US Fish and Wildlife Service (US FWS) received multiple petitions to list the greater sage-grouse under the Endangered Species Act (ESA). In 2008 the FWS announced a status review and requested new information for the species in response to new listing petitions. The FWS reached the conclusion in 2010 that listing of the greater sage-grouse was warranted due to habitat loss and fragmentation and inadequacy of regulatory mechanisms that govern habitat loss and fragmentation. Nevertheless, the FWS determined that the listing was precluded because of higher-priority listing actions. Spurred to action by strong interest in preserving the Greater Sage Grouse and concern about possible ESA listing many agencies and organizations came together to address the challenge of protecting the species over a large landscape. The Bureau of Land Management and U.S. Forest Service developed comprehensive land use plans for public lands in 10 western states to help to conserve greater sage-grouse habitat. The Western Governors Association and the Western Association of Fish and Wildlife Agencies (WAFWA) played an important role in coordinating greater sage-grouse conservation initiatives among states and federal agencies. In their Sage Grouse Inventory 2014 Conservation Initiatives the WGA summarized the activities taking place to conserve the sage grouse in all 11 states within the species range. The WAFWA focused on educating their membership and providing a clearing house for information on initiatives related to greater sage-grouse and a vehicle for states and federal agencies to pool funds for large scale projects. The Sage Grouse Initiative has worked with more than 1,129 ranches to conserve more than 6,000 square miles of sage-grouse habitat in 11 western states. Launched by the USDA Natural Resources Conservation Service in 2010, the intiaitive applies the power of the Farm Bill to fund and certify voluntary conservation projects in sage grouse. More than 75 percent of these acres lie in Priority Areas of Conservation designated by the U.S. Fish and Wildlife Service. This means these investments benefit large sage-grouse populations along with hundreds of other wildlife species, including economically important big game such as mule deer, pronghorn and elk. Finally, efforts to conserve greater sage-grouse habitat were not limited to state and federal agencies. Industry and private landowners also developed means of conserving greater sage-grouse. In March 2015, the Secretary of the Interior announced the approval of the privately held Sweetwater River Conservancy Conservation Bank for the greater sage-grouse on over 55,000 deeded acres in central Wyoming. Not only was this the first conservation bank for greater sage-grouse, it is the largest habitat conservation bank in the U.S.
Based on all these efforts in September 30, 2015, the U.S. Fish and Wildlife Service (FWS) conclude[d] that the Greater Sage Grouse does not warrant protection under the Endangered Species Act (ESA). In a press release the Secretary of Interior credited the voluntary conservation efforts and the partnerships between federal and state agencies as well as private land-owners and conservation groups for contributing to this historic decision. However, landscape partnerships are extremely hard to energize and sustain. It is critical to recognize that it was the hammer of the ESA listing that kept everyone working together and developing new ways to address the challenge.